Railpictures.ca - Michael Berry Photo: Preparatory work for the REM (Réseau express métropolitain) light rail project has begun where it will parallel CN’s St-Hyacinthe Sub. Here VIA 67 with VIA 6413 leading crosses the Lachine Canal, with work ongoing underneath. | Railpictures.ca – Canadian Railway Photography – photographie ferroviaire Canadienne. Caption: Preparatory work for the REM (Réseau express métropolitain) light rail project has begun where it will parallel CN's St-Hyacinthe Sub. 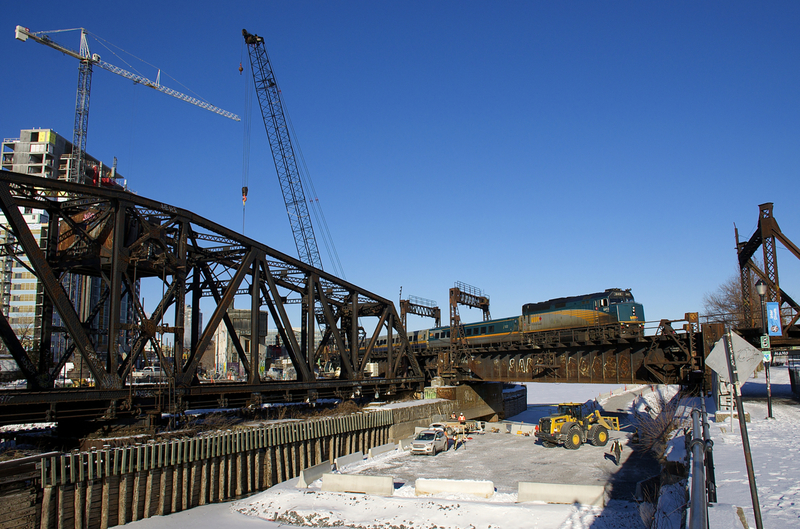 Here VIA 67 with VIA 6413 leading crosses the Lachine Canal, with work ongoing underneath.